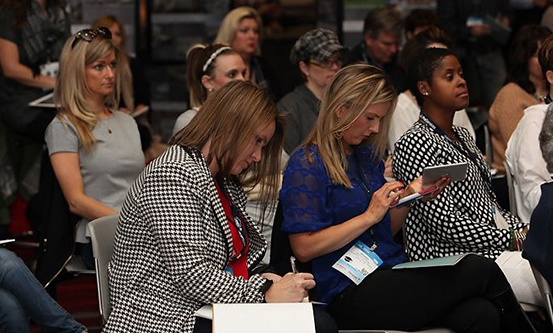 With over 1,500 exhibitors participating in the IBS, it becomes critical to do something to stand out from the crowd. 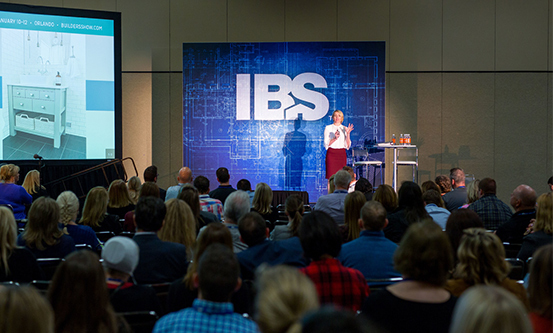 IBS has numerous marketing options to help you have the most successful show possible. Please browse our inventory of marketing opportunities. 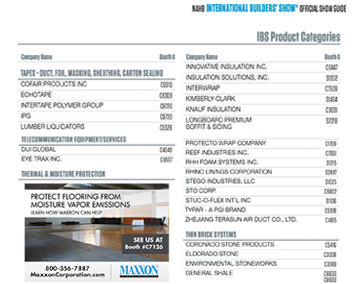 Download the IBS Sponsorship & Advertising print version. Take advantage of this one-time opportunity to get a deeply discounted marketing package featuring some of our most popular marketing items and show your support of the 75th anniversary of the IBS. Presentations that focus on disruption, innovation and the future of home building dominate this interactive area located in the South exhibit hall. These new four-sided, rotating, lighted cubes will definitely draw attention. 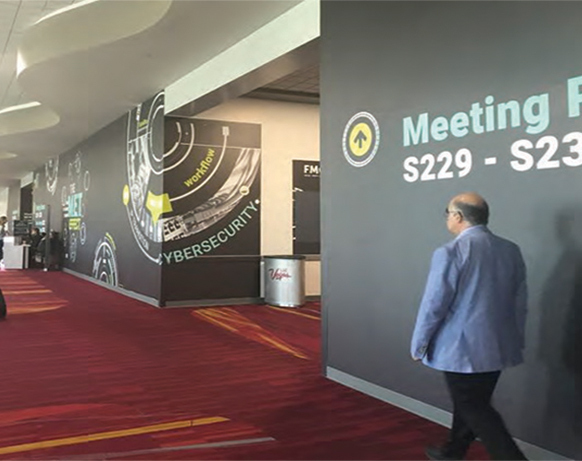 New for 2019, IBS is offering banners that can be applied directly onto wall surfaces at the LVCC. 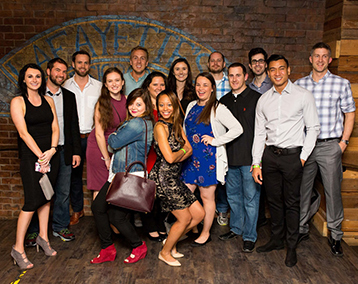 The IBS Scholarship program is offered to a selected group of approximately twenty young (21-35 years old) NAHB members who are new to the industry. The IBS Store is one of the major destinations for IBS attendees and will be located centrally in the Central Concourse of the Las Vegas Convention Center. 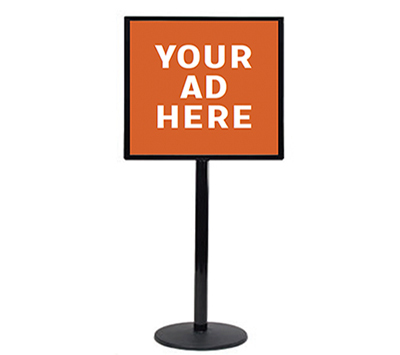 Placing an advertisement on the side of the IBS Store will yield lots of impressions daily and will reach an educated and highly-successful audience. 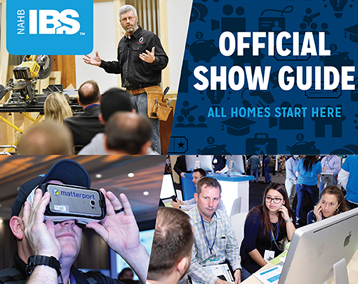 The IBS Official Show Guide is the source of information for IBS exhibits and educational sessions and is used by nearly all IBS attendees. Estimated circulation is 60,000. For highly targeted advertising, you can place your message at the top of your product categories in the Official Show Guide. 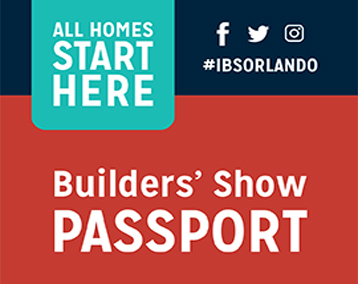 The IBS Passport is included in the Pre-Registration Credential Packet and also distributed at the Show with an estimated print run of 40,000. The DCW Fold-Out Map will provide attendees with a useful, easy to read detailed map of the Las Vegas Convention Center. The Pre-Reg Credential Mailer Packet contains the materials attendees need to gain access to IBS events. Exhibitor coupons are effectively used to promote product launches, booth giveaways and drive traffic to your booth. 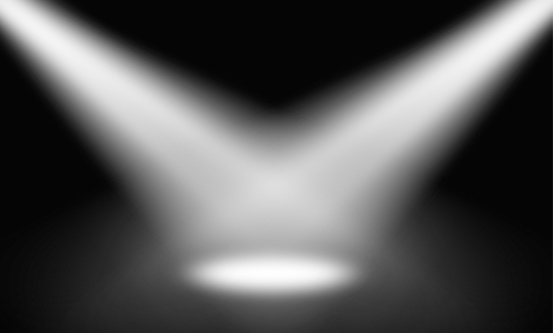 You can get your company’s message in front of pre-registered IBS attendees before they arrive in Las Vegas by using a pre-show direct mail or email list. 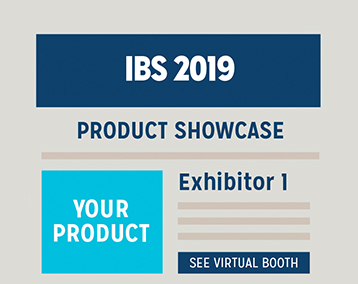 For a highly focused IBS attendee list, you can now reach IBS attendees based on what types of products they want to see. 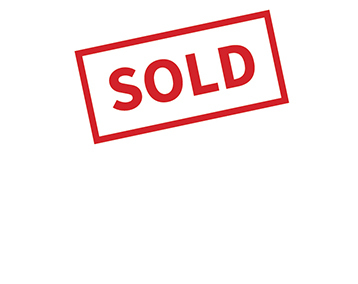 The lanyards sponsorship is certain to call attention to your company and draw additional buyers to your booth. 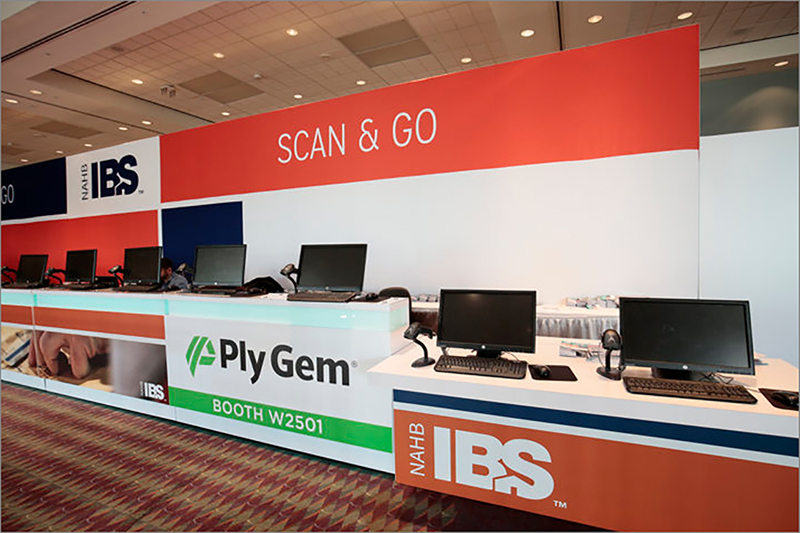 Place your company’s message directly on both sides of the IBS attendee badges. The Show Bags are placed in prominent locations and are picked up—and then reused—by thousands of buyers, resulting in tons of exposure during the Show. As the IBS Registration Sponsor your message is in front of ALL IBS registrants. 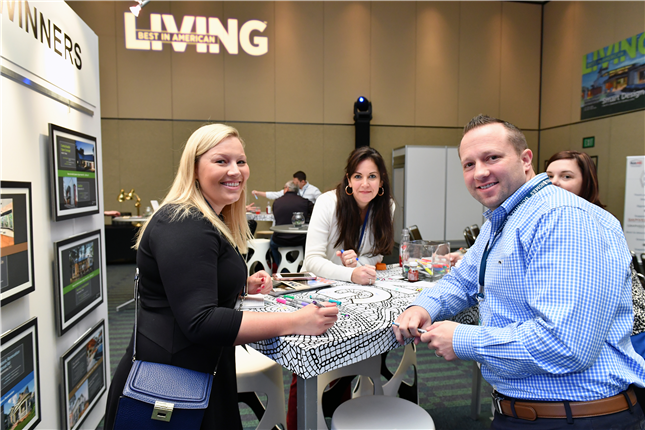 Located in the convention center, these rooms provide a more quiet space to meet with clients, conduct focus groups, relax off of the show floor, showcase new products, etc. 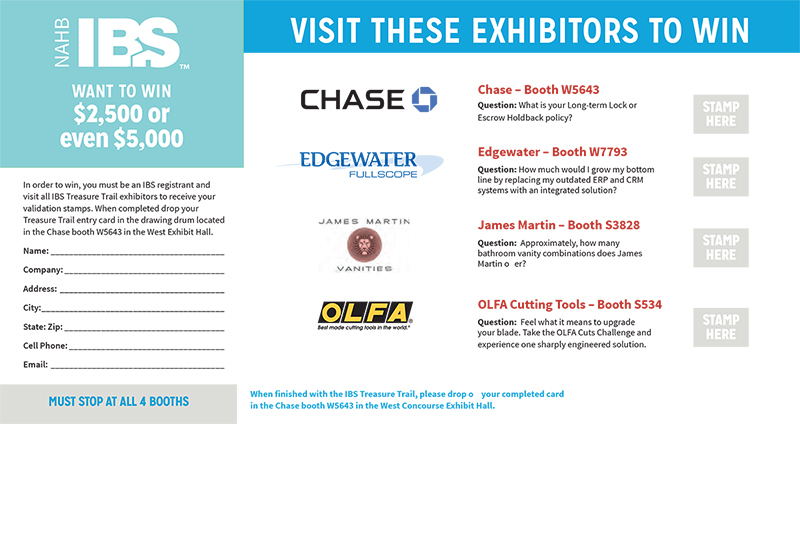 IBS attendees receive the Treasure Trail card and are encouraged to enter to win daily cash prizes. 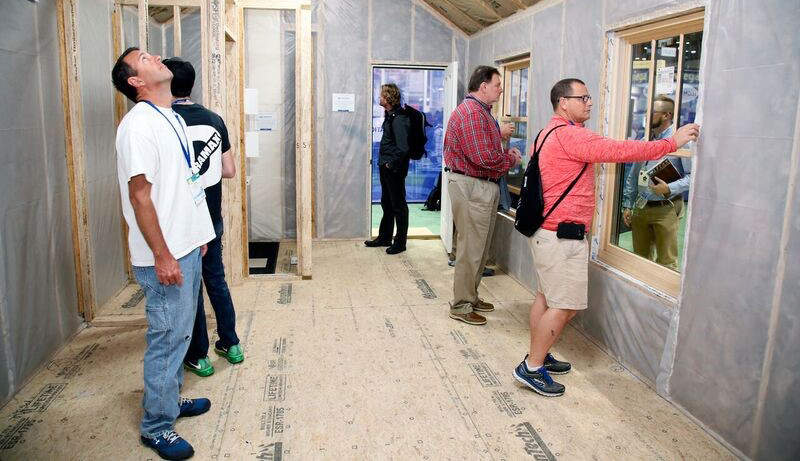 In 2018, the HPBZ’s live building science demonstrations and ‘lab home’ were seen by overflow crowds of more than 5,000 and were highly reviewed. 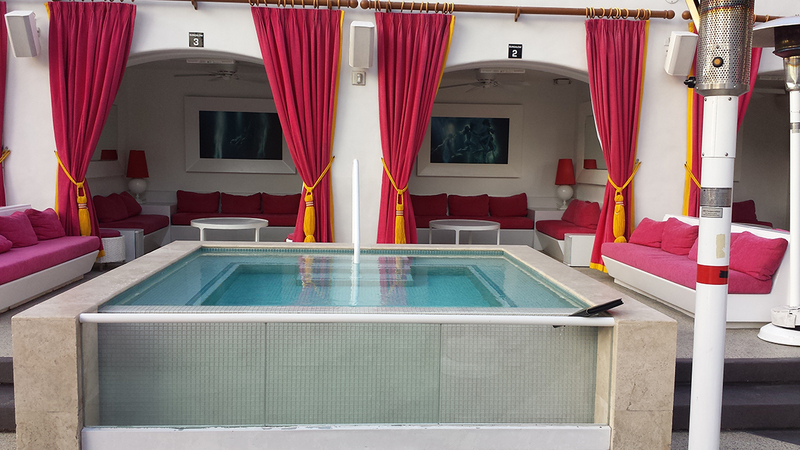 This package includes twelve (12) tickets and reserved seating at one of poolside cabanas that features a dedicated cabana server, views of the Drai’s Beachclub pool, the Las Vegas Strip and the Bellagio fountains. 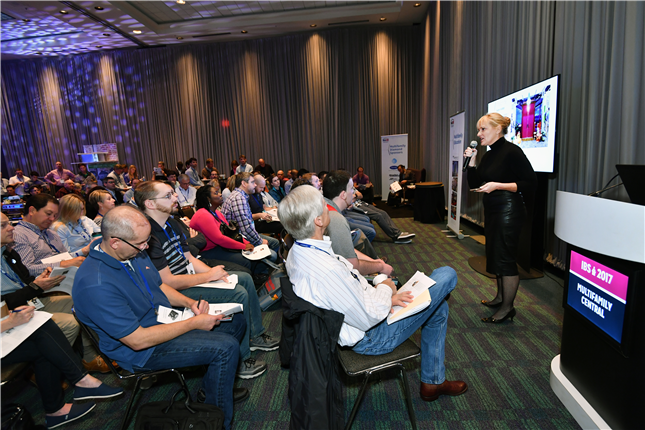 Known for innovative programming and engaging speakers, sponsoring the IBS Education, will place your company at the forefront of thought leadership and among industry leading brands. The 55+ Central is the core of 55+ activity for attendees who are actively involved in developing communities for the nation’s boomer marketplace. 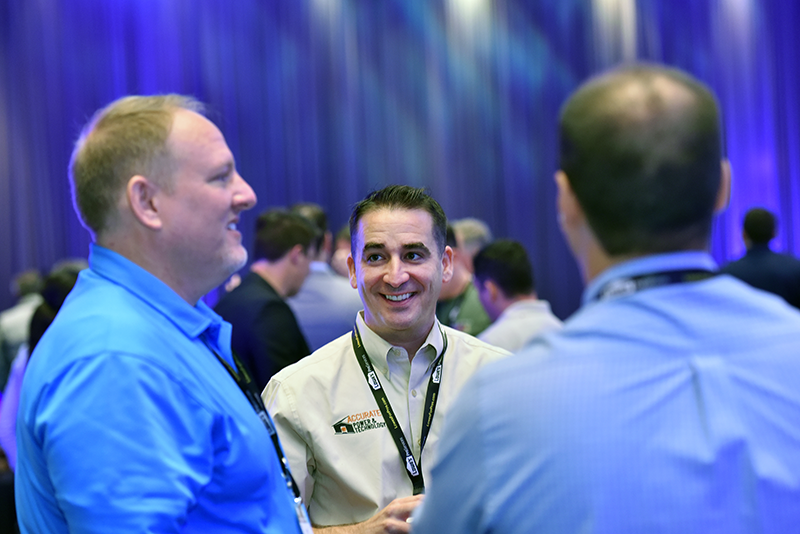 An NAHB Remodelers Central sponsorship provides you with unparalleled access to the key decision makers in this industry—and their impressive purchasing power. 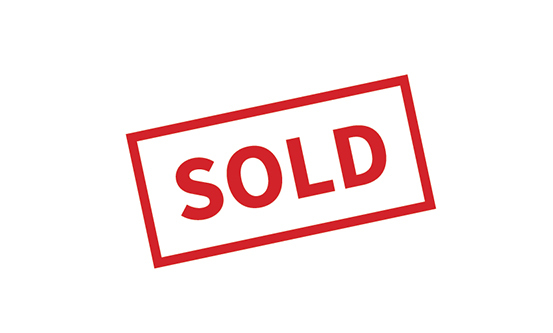 Sales Central is the place where custom builders, developers and remodelers come together with sales managers, marketing directors, sales and marketing consultants, real estate agents and others in the marketing business. 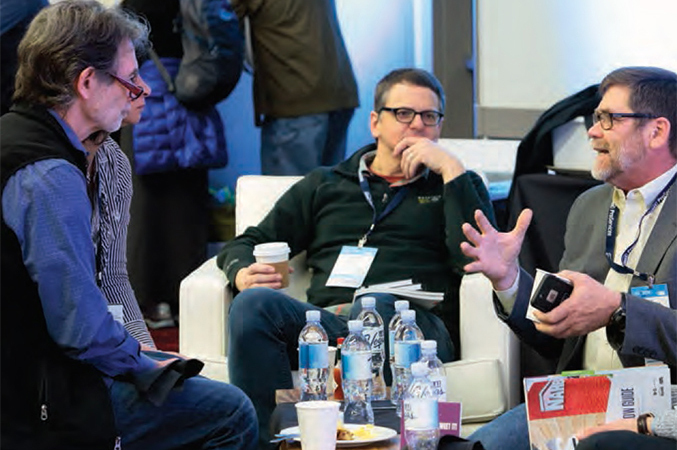 Capitalize on the strong multifamily market by connecting with the powerful audience of apartment and condo developers, builders, owners and managers at IBS. The Design Studio offers engagement opportunities with the powerful design niche within the home building industry—the specifiers. Your company will capture crucial mind share with residential design professionals. 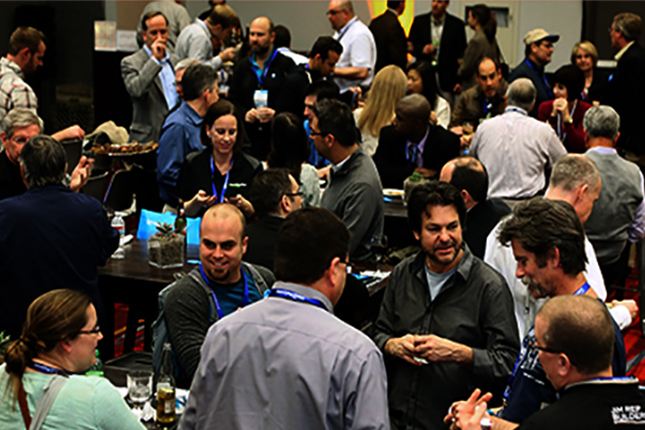 Year after year, single family custom builders are the largest group of attendees at the IBS, with approximately 8,000 in attendance. 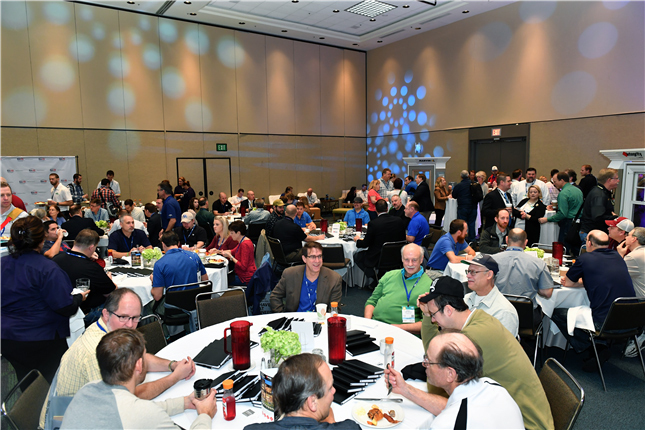 Sponsor the food functions in the shared DCW Press Room and reach an unprecedented audience of influential trade and consumer media. Supply thumb drives to the registered press at DCW and enable them to download the exhibitors’ press kits. 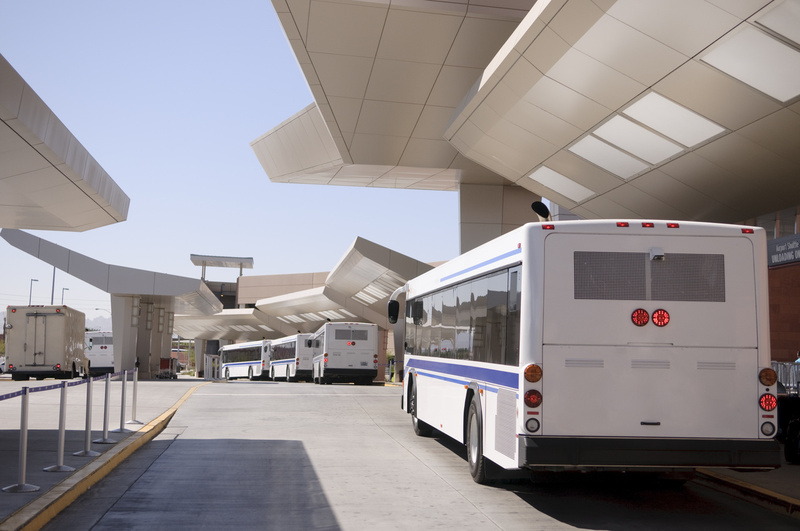 A great way to get your company’s message out all over Las Vegas is to advertise on the shuttle buses. All prices include production and installation. IBS shuttle buses offer two color headrest-marketing opportunities. The headrest image consists of an 8” X 8” area. 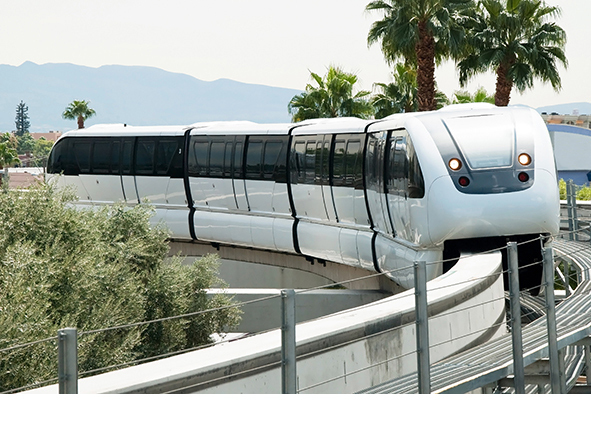 The Las Vegas Monorail (LVM) has seven stations and platforms to showcase your brand and is visible from more than 10,000 hotel rooms. 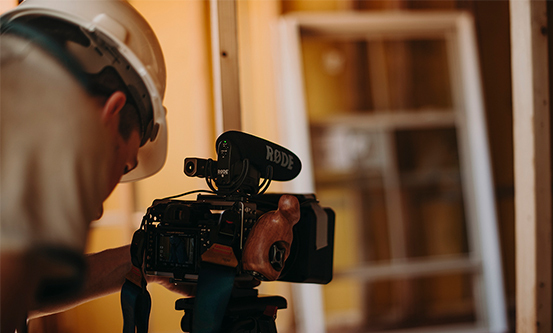 NAHB’s award-winning Production Group (Structure Productions) will film a 60-second product spot in your booth, with super-host Tracy Locke interviewing your staff. 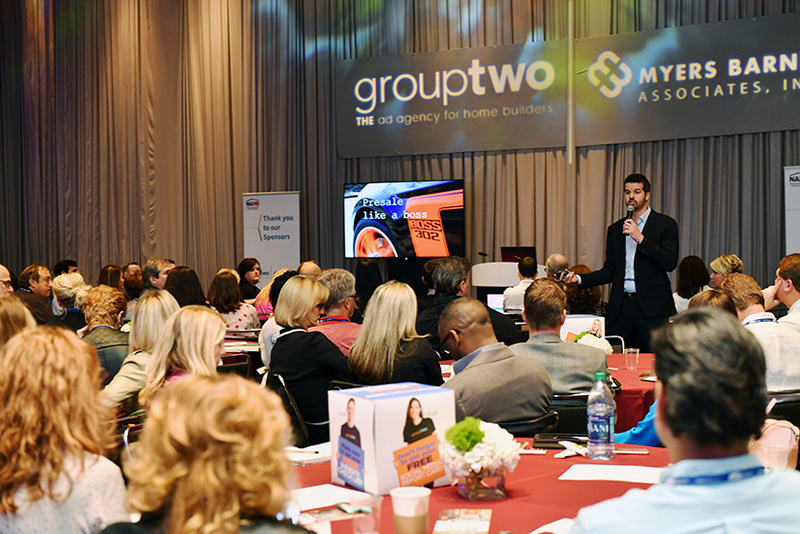 Sign up to have NAHB’s production group, Structure Productions, film your booth for a fraction of what an outside vendor would charge. 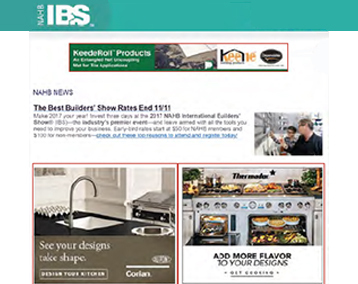 The 2018 IBS Mobile App had approximately 1.2M page views, and was downloaded more than 14,000 times, leading to tons of additional exposure. 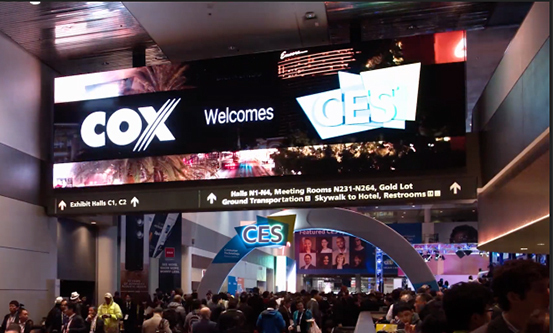 Advertising on the ever-present LVCC’s digital network gets your images on 15 screens all around the Convention Center—including the enormous (40’ wide x 14’ high!) new video wall in LVCC’s Central Concourse. 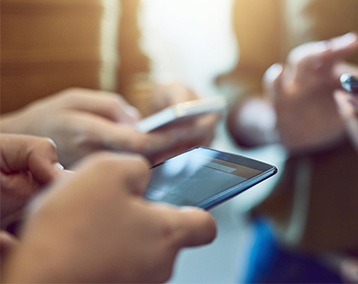 A majority of our users access the website via their mobile phones and advertising has been cut to a minimum so our users can find what they need on the site easily. 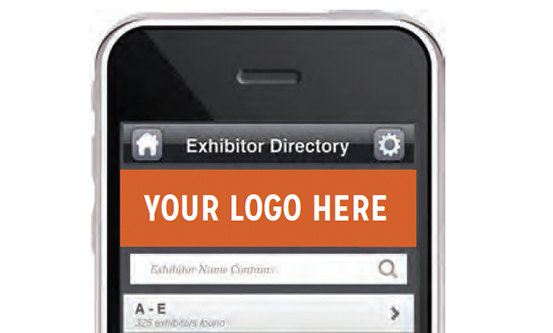 Priority positioning in site search results, special search on BuildersShow.com for “Featured Exhibitors”, video and graphics upgrade to online company listing (two videos + up to five images) and featured Exhibitor special listing in the IBS Mobile App. 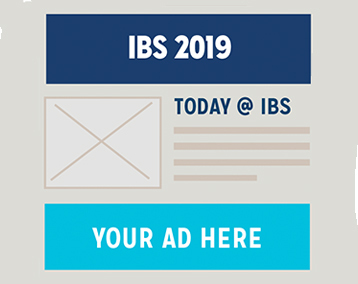 Reach attendees from your targeted audience at the 2019 IBS by including a banner advertisement in a confirmation email. 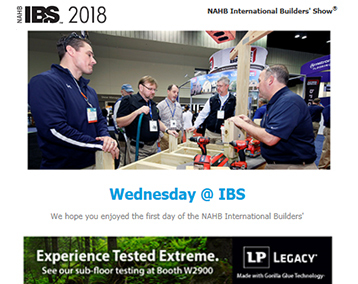 The IBS Product Email is sent to IBS attendees three times before the Show and one time post-Show. 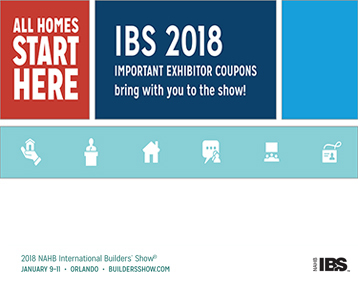 NAHB sends out multiple IBS Alerts before the Show. The Alerts announce a recent development or can promote highlights of the upcoming Show. An email will be sent each day about the Show and the daily highlights. You’ll be able to place the only advertisement into the middle of the daily email. 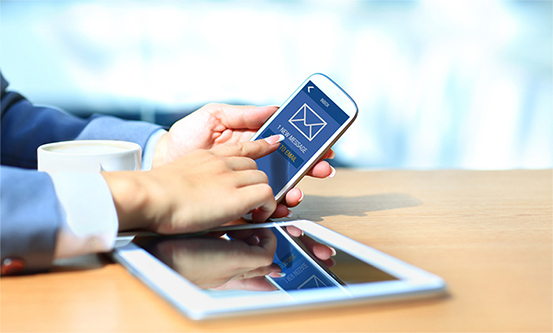 An email will be sent each day of the show that contains messages from a maximum of six exhibitors promoting what is happening in their booth that day. 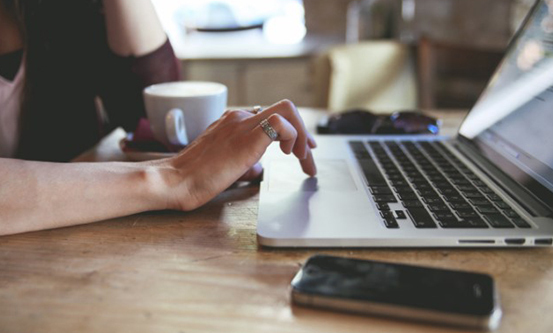 The IBS Industry Tracker email is a digital marketing opportunity with widespread reach (more than 110,000 recipients). These new four-sided, rotating, lighted cubes will definitely draw attention. 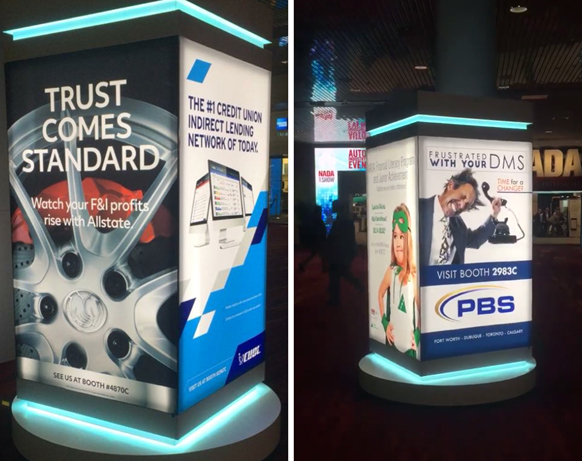 Placed at eye-level and backlit, you’ll get noticed with these signs. 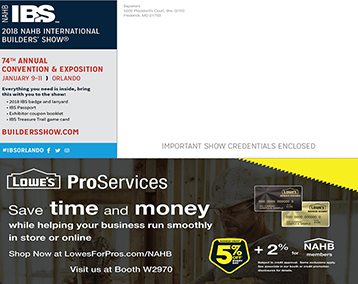 The 2019 IBS Aisle Sponsorship places your message over the top of all IBS exhibit aisles in the Show. 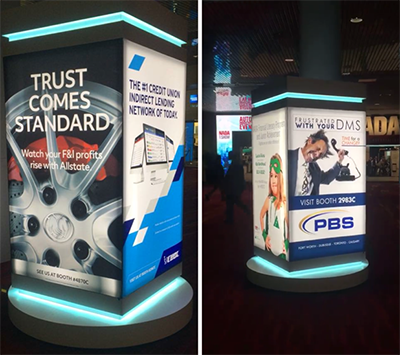 Placed in high-traffic public areas of the Show, these freestanding, two-sided displays are a great way to gain additional exposure for your company. 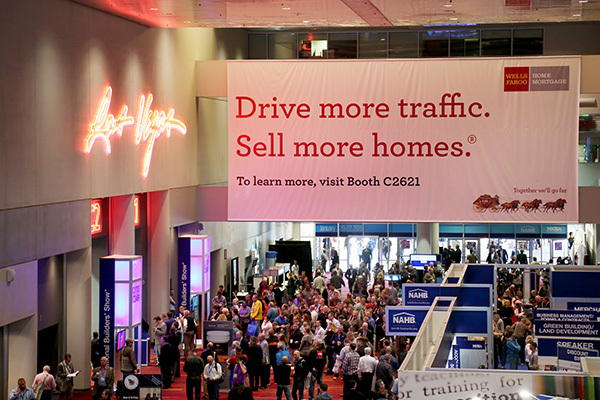 Show-site advertising is a proven way to increase traffic at your company’s booth. 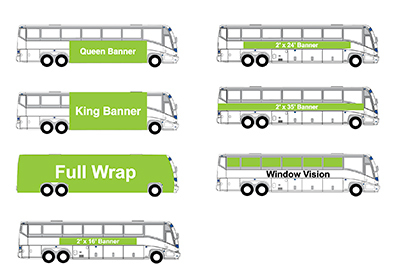 Banners for all budgets, large or small exist. Interested In A Sponsorship Opportunity? Contact Us!